Cruising with vintage motor-sailing ships along the magnificent Dalmatian coastline and islands. For this trip all you will need is a few T-shirts and a swimming costume to spend seven unforgettable days sailing on the northern Adriatic Sea from one island to another. Relax and let the captain and his crew (especially the cook) take care of you. During the day you can swim, snorkel, sunbathe, and explore the underworld of the Adriatic Sea. The evenings you have free to find a good restaurant or discover old churches or other historical monuments. Departure from Split harbour, Saturday at 13:00 h. After lunch cruise along the Dalmatian coast down to Makarska Riviera. We spend the afternoon swimming at one of the beautiful beaches on the Riviera. 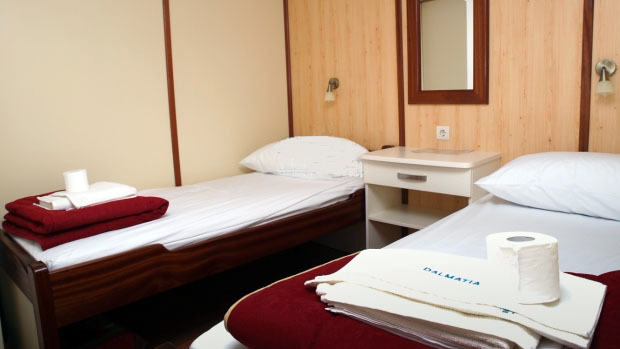 Overnight in the port of Makarska, one of the most attractive resorts on the Croatian coast. Strolling along the streets of Makarska, you will come across numerous churches and other architectural and cultural sights. Early in the morning we continue our trip towards Mljet. Our first stop is in Loviste, on the Peljesac peninsula. After a refreshing swim we continue towards Mljet. The whole afternoon is free to look at the salt lakes in National Park and enjoy the sun and sea on this peaceful island. Overnight in port Polaca/Pomena. In the middle of the large lake, inside the National park, we can visit an old abbey and church, or just use a small boat to roam around the National park. After breakfast we depart for Dubrovnik, which will be the highlight of our cruise. There will be time just for a short swim. Enjoy the beautiful sights of nature along the way towards “the heaven on earth” - according to the famous writer George Bernard Shaw. 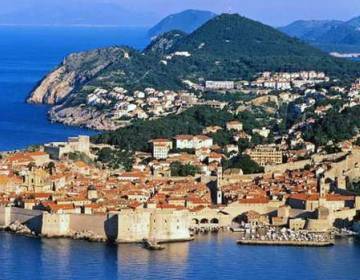 We will arrive to Dubrovnik late in the afternoon. Take a walk through Stradun - both a street and a square, a promenade inside the city walls. For those of you with more enthusiasm we recommend a walk on top of the 1,940 m long city walls! Overnight in the port of this magical town. Morning is free to explore Dubrovnik. Discover the beauty of history through numerous monuments, little streets, churches… Around lunch time we leave this magnificent town and continue our cruise towards the isle Sipan or a little town of Trstenik on the Peljesac penninsula, where we will swim in the afternoon and spend the night. After breakfast departure to Korcula, the birthplace of Marco Polo. Lunch on the board somewhere in front of Lumbarda (part of Korcula). Sightseeing of Korcula - overnight in port. On this island you can find more legends, tales and monuments than anywhere else. Listen to the story of the stone walls, which were being built over two centuries ago. Early in the morning we depart for the Pakleni Islands where we have lunch and time for swimming. Departure for Hvar after lunch. Hvar is the longest island in the Adriatic. Here we can find the Renaissance cathedral with its original tower; also the oldest community theatre in Europe was founded here in 1612. City of Hvar offers plenty of restaurants, bars and cafes that are open long into the night. Our next stop will be the island of Brac. Swimming is planned at one of the most known beaches in Dalmatia - Zlatni Rat near Bol (the Golden cape - its gravel promontory shifts from side to side as the wind and waves constantly change in shape). Bol is a typical fisherman’s town turned into a popular tourist destination. After lunch we will start our journey back to Split where the last overnight is planned. On our way to Split there will be another swim-break in one of the many bays on island of Brac. Arrival to Split in the late afternoon. Enjoy the view of Split Riviera arriving in Split. Split is a monumental city under UNESCO protection that belongs not only to Croatians, but also to you, as it is a part of the world heritage. Here we find an abundance of Roman architecture - of special interest is the Diocletian palace. 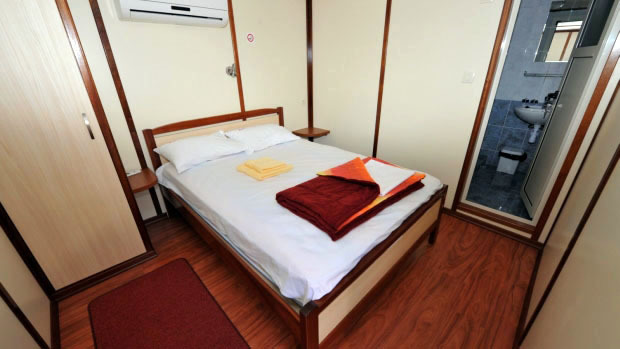 Bedroom with 1 bed, SAT-TV-LCD and telephone, bathroom / WC with showercab and passage. The cabin is integrally air conditioned. 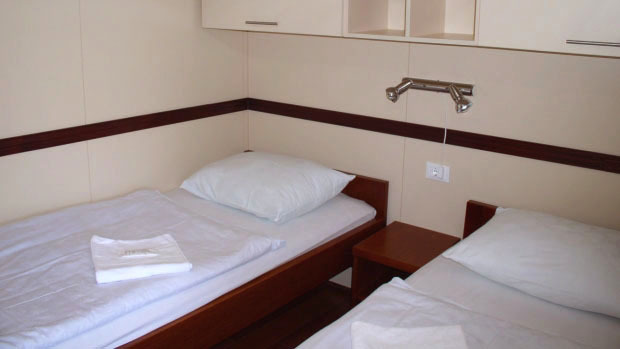 The size of the cabin is approximately 10 m2. Bedroom with 2 beds, SAT-TV-LCD and telephone, bathroom / WC with showercab and passage. The cabin is integrally air conditioned. The size of the cabin is approximately 12 m2. Bedroom with 3 beds, SAT-TV-LCD and telephone, bathroom / WC with showercab and passage. The cabin is integrally air conditioned. The size of the cabin is approximately 14 m2. Ship: Classic Breakfast and Lunch, Cocktail Bar, Dancing Terrace, Restaurant a la Carte, Snack Bar. Route: Split, Makarska, Mljet, Dubrovnik, Trstenik, Korcula, Hvar, Split (Weekly Arrangement). Beach: Pebble, Rocky, Paved and Sandy characterized by various small Lagunas (Sand in the Sea). Extras: Entrance Fees in Historical Monuments and Croatian National Parks (not obbligatory).